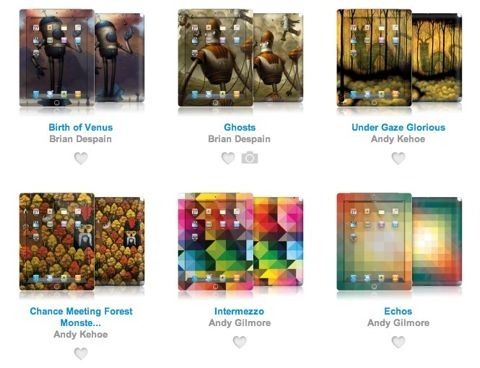 Gelaskins are ultra-thin, ultra-light skins for the iPad (and a huge number of other mobile devices) that feature striking and unique artwork from a wide range of artists. They’ve been my favorite companion for my iPad 2 and its smart cover for some time now – partly because they offer such unique and compelling designs and also because they offer a little bit of protection for the back of my iPad 2 while keeping its wonderful lightness. So I was happy to see a promo email from the today touting their fresh new crop of designs for the iPad, the iPhone 4 / 4S and other devices. As always, there are lots of wildly creative choices – and they’re good value at $29.95 for iPad and iPad 2. I’d love to say I grabbed a brand new design when I visited Gelaskins today – but instead I ended up ordering an old favorite back – the Dr. Gonzo one by Ralph Steadman.